*This post contains affiliate links. Please see my complete disclosure policy for more details. We didn’t really make it through too many books on the bookshelf this month. The majority were either checked out from the library or Madison re-read. But that’s ok, sometimes it works out that way. Also, NuMinds recommended a book to me that is AMAZING! 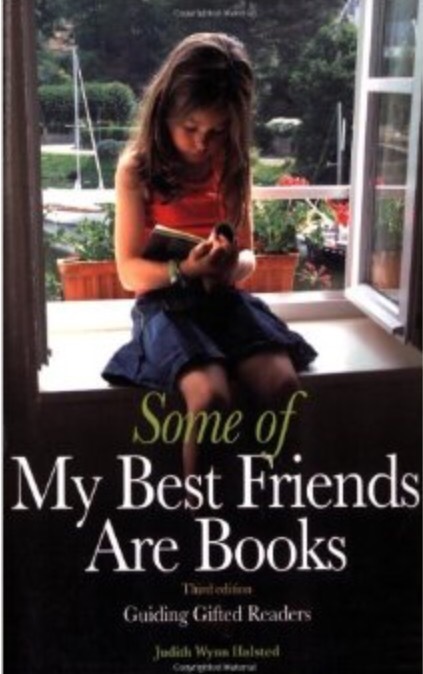 It is called Some of My Best Friends Are Books: Guiding Gifted Readers (3rd Edition) . (A huge thank you to NuMinds and if you would like to follow them, click HERE for their Facebook page.) This book not only has book lists and questions to discuss for ages preschool-high school, it also entails how parents and educators can guide gifted children through the books they read. It covers every aspect of the social, emotional, and intellectual needs of gifted children and the books that are listed have characters and text they can identify with. The questions listed for each book really helps tie the characters and the book together with a thoughtful and encouraging process that helps gifted children learn how to address big feelings and thoughts they encounter in a positive way. I cannot express how much I love this book. And with that said, Madison has read a couple from the list and will be reading many more in the future! The third book was released from the Story Thieves Series and so when it was delivered Madison decided she wanted to read the first two again before reading the third. She hasn’t started the third one yet. And Madison decided to re-read the Percy Jackson series before moving on to the next series by Rick Riordan. She’s a little obsessed so I’ve had to hold the rest of the series hostage so she will do other things like school work, eat, sleep…. Hold it hostage! LOL!!!! Yes. That could possibly be a tactic in our household.